A Female Qazi Conducts a Couple's Nikkah and This Is a Pretty Unusual Thing! A Female Qazi Conducts a Couple’s Nikkah and This Is a Pretty Unusual Thing! Unusual because we have never seen a female qazi solemnize a Muslim marriage before, right? Well, this happened somewhere in India. While the world debates on how women can do this or women cannot do that, there are some individuals who try to break barriers of all sorts. 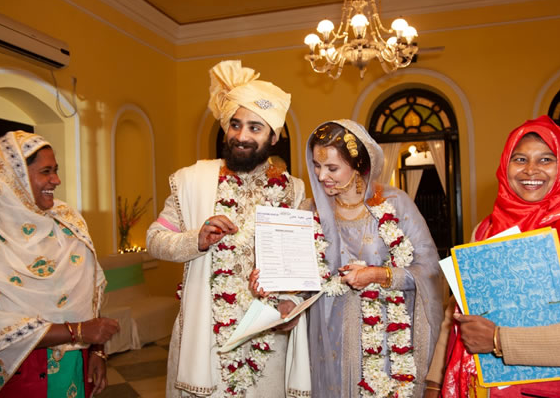 In the essence of reclaiming the spaces, a couple got their marriage solemnized by a female qazi in Mumbai, India. While in Islam there is no prominent event where a woman qazi has been stopped from conducting the solemnization of a nikkah, the religious binding of a man and a woman has mostly been conducted by male qazis. The nikkah took place on 5th January 2019. Maya, a communication consultant shared with media that a few years back she was exposed to an article where it stated that female Qazis are allowed to conduct nikkah. Maya further shared that she was not aware of this practice, which is why she felt intrigued to apply this for her marriage. The couple eventually agreed on this ritual and hence, got their nikkah done by Qazi Hakima. The events where a female qazi conducts a nikkah is rare and it was a problem for Maya and Shamaun as well. Even in India, it is rare to find female qazis. The couple, with the a lot of hunting, found BMMA; Bharatiya Muslim Mahila Andolan. They found out that the female Qazis are trained and possess constitutional rights. When the couple found out that BMMA offers female qazis for nikkah conducting, they felt their wish come true. “It feels nice to give another woman a platform like this, which ideally should be easily available to her anyway. It has been empowering for her and me, both,” said Maya when asked how she feels getting her nikkah done by a woman. So what do you think, should something like this be normalized in our society? While this has been mostly done by males, it is rare to see women taking such a space. Share your thoughts!